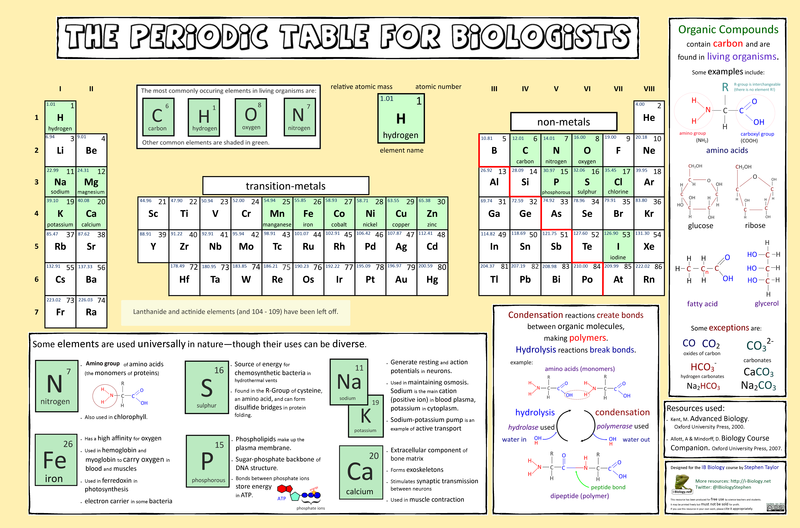 Periodic Table for Biologists, AO printable version (.png, 3MB). Last updated Jan 2013. Here is an updated and corrected version of the Periodic Table for Biologists poster I produced a couple of years ago. It is designed to address some of the assessment statements for the Chemistry of Life unit, and to provide a clear wall-chart that is free to use and free from advertising. There is a better update in the works, which will align more closely with the periodic table from the Chemistry course and include relative atomic mass. Downloads as a super-large (A0) .pngfile, at about 3MB. UPDATE: Featured on ChemoGenesis, the internet database of periodic tables. Visit the ChemoGenesis web-book for more Chemistry information and the internet database of periodic tables, from antiquity to the present day. I am a 8th grade teacher in NC and came across your site while researching some information about the periodic table for my chemistry class this year. I just wanted to thank you for the great information and articles about the the periodic table. We would love it if you could write a few articles for us, but I understand if your busy so a link to some of the current articles would be very helpful as well to help us spread trusted resources to other teachers. I have included a link to the site in case you would like to help us out by linking to it, tweeting it, or adding it to your Facebook profile. Thanks for the message about the periodic table. I would like to produce some articles for you, though at the moment am incredibly busy with a programme evaluation in my role as IB Diploma Coordinator. If there are any articles already on my site that you’d like me to edit for you, please let me know.